I know this is a little late but as christmas is my favourite time of year I can be indulged into stretching out the festive season. I can come up with more excuses. Feel free to take your pick: I’ve been busy as cookery school has just started, I’m feeling grumpy because of the cold weather and I’m rebelling against the usual view of January as the month of abstinence. The Gingerbread house my friend and I made might just be the antithesis of abstinence. I believe we covered most of the major food groups: chocolate, toffees, marshmallows, sweets and of course plain old sugar. 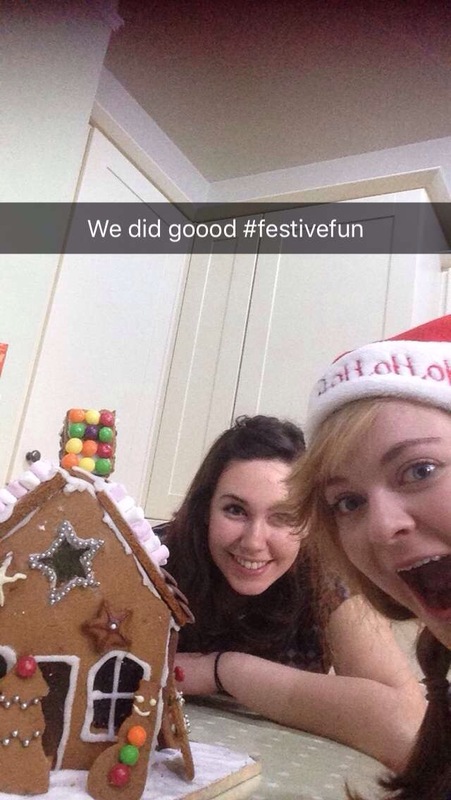 Even the centre of the house contained a hidden treat of all the sweets leftover, the windows were boiled sweets and the ‘snow’ was marshmallow frosting. 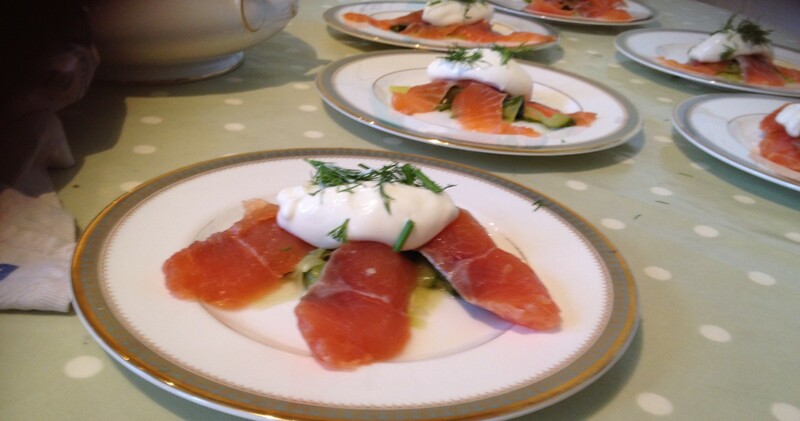 Of course this wasn’t so much a cookery session but rather a challenge in architectural design. 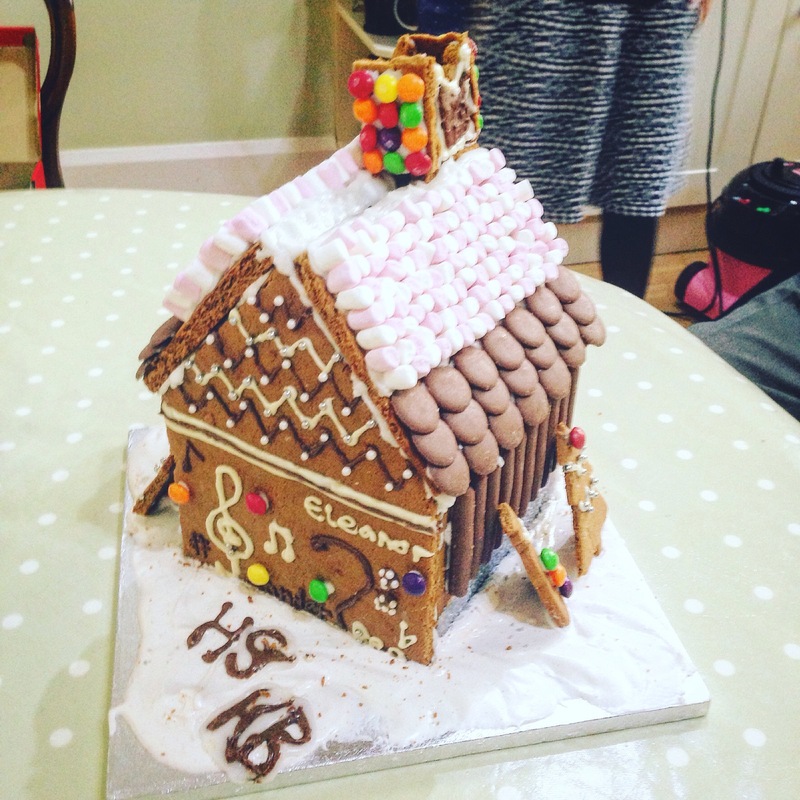 Using an adhesive icing, similar to the consistency of superglue we gingerly (excuse the pun), tried to join together pieces of gingerbread meticulously measured with rulers and templates – and still then we didn’t get them straight….. -. I’m not sure whether the icing had drunk some of the mulled wine we were enjoying as we put this together but it was definetly touch and go for a bit as we held it together whilst it dry. The chimney was definitely drunk. However it was all worth it. Other than an excuse to dance around the kitchen to christmas music (hghlights included Buble’s album and ‘Christmas goes Baroque’) whilst consuming excessive amounts of sugar there was actually a more targeted purpose. Throwing myself into my short lived career as a babysitter this autumn wasn’t as smooth sailing as I hoped. Babysitting in sixth form had been a doddle. The children were generally old enough to practically take care/amuse themselves or they were asleep in bed and I watched tv. However, try amusing a 3 year old for the whole afternoon and you will begin to understand why nannying is so well paid. There is only a certain amount of ‘lets pretend’ game situations I can enact. So I decided to approach babysitting with ales son plan approach. We made cards, went to see the ducks and of course my personal favourite; cooking. Turns out the three year old is rather keen on it too. Plus she is excellent at washing up. You haven’t seen anything until you’ve seen a three year old, standing on a chair in marigolds singing her own washing up song. 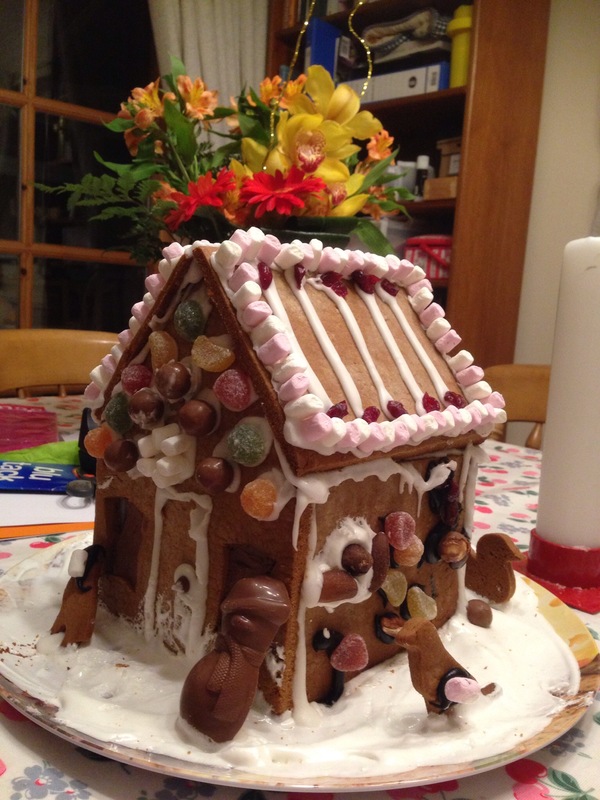 So with Christmas approaching we embarked on our most ambitious at; the gingerbread house, along with her older sister. We baked it, she got bored and watched CBeebies while I cut it out and then we all decorated. Out it this way. Some sides were decorated by the 3 year old, some by the 11 year old and some by the 23 year old….but it stuck together and we were rather proud of our efforts are more than a little intoxicated by sugar. The next day I receive a text from the parents of said children asking for a photo. They explained that they had misunderstood the purpose of the house and eaten it… The 11 year old hadn’t spoken to them for a day. All in all I couldn’t have found a more deserving recipient of the house my friend and I made, the kids faces were probably what Christmas is all about. Can’t wait till next year now. 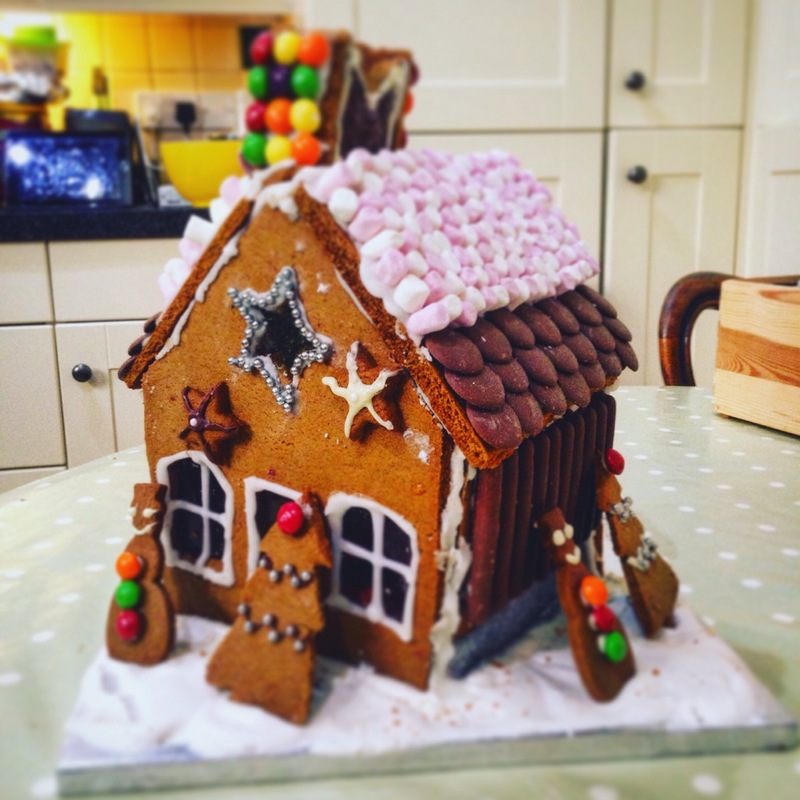 This entry was posted in Experiences and tagged biscuit, Christmas, gingerbread, house, sweets. Bookmark the permalink.